As Mary Meeker, the Queen of the Internet, made clear earlier this year, mobile is on the wrong side of a monetization gap. While consumers are spending more and more time on mobile devices, advertising revenue there is still lagging well behind traditional online — some $30 billion was spent in online advertising last year in the U.S. vs. $1.6 billion for mobile ads. Ad rates on mobile are 5 times lower than on desktop. Advertisers are expected to chase the eyeballs to mobile, though to what extent and how quickly is unclear. Mobile presents particular challenges for advertisers because they don’t have the same retargeting tools (like cookies) that they have online, the screens are smaller, and ads have the potential to be more intrusive than on the desktop. 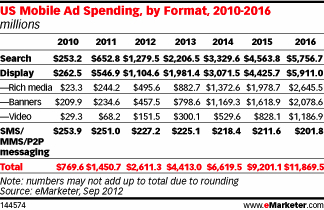 For now, marketers are spending more on ads for smartphones than for tablets, because more people own the former than the latter. But some of the metrics suggest that tablets may have better monetization potential. Click-through rates for the iPad, for example, are twice that of the iPhone, according to Inneractive, a mobile ad exchange, and thus the ad rates are also higher for the iPad. Whether mobile ads ever catch up to online advertising in revenue will have huge ramifiations for big companies like Facebook (s fb), Twitter and Pandora (s p) whose audiences are rapidly shifting to mobile devices. Currently, the sectors that spend the most on mobile advertising are telecommunications, retail and restaurants, automotive, finance and education, according to Millennial Media. Many brands, however, are still just experimenting with mobile and are spending a very small percentage of their ad budget there. Here’s a look at the main categories of mobile advertising, as well as some emerging strategies that publishers and developers are banking on to help close the monetization gap. 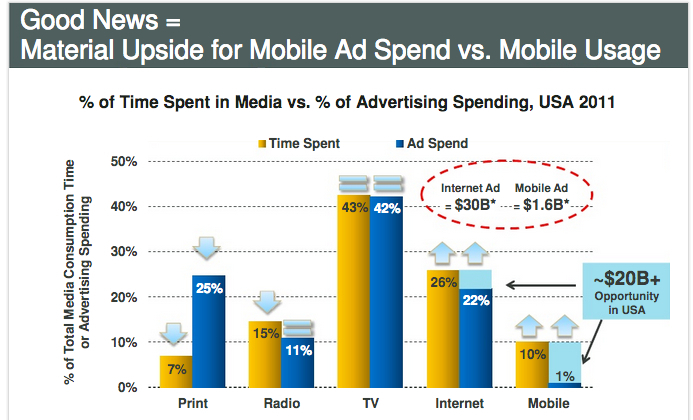 Still the big dog in mobile advertising, bringing in about half of all mobile ad spending. That is likely to continue as consumers turn to their smartphones as a research tool while on the go. As Google pointed out, the smartphone is often the first step in a longer research process that continues on a tablet or computer. Mobile search is also valuable for advertisers because most consumers are very intent-driven when they search on a mobile phone and are likely to complete a task after searching. Google said that 9 out of 10 mobile searches by users have resulted in an action such as a purchase or a visit to a business. While Google, which pretty much owns this category, can obviously benefit from growing mobile search, local search engines like AroundMe and location-based services like Foursquare may also see a lift. The rise of mobile apps may also threaten Google as more consumers get their mobile queries answered through a dedicated application. Companies with the most revenue: Google (95 percent of the market). These offer advertisers an often pricey way to take over a screen and give consumers what can be a more immersive experience. Advertisers can use video, animation, photo galleries and interactive elements, which can make mobile advertising more akin to a TV commercial or a slick magazine. Opera Software, the mobile browser company, reported in July that users who clicked on a rich media ad spent an average of 52 seconds viewing a video and 1 min and 25 seconds interacting with photos. Opera noted that advertisers have started using rich media and video ads more frequently this year than traditional banner ads. Some of the most popular ad units in mobile are banner display adds, but in terms of ad spending, they were eclipsed by search ads last year. Display ads are still very prominent, in part because advertisers can buy in standard formats, like they’re used to doing online. But the units are problematic on small screens because they can trigger more accidental clicks. And if advertisers keep the banners small to avoid turning off users, then they can run into another problem — namely that they’re harder to make engaging and thus easier for readers to ignore. A traditional online banner ad may fetch $3 to $5 for every thousand impressions, which is still a lot more than mobile banner ads, which receive $1 or less on a smartphone, the New York Times reported. 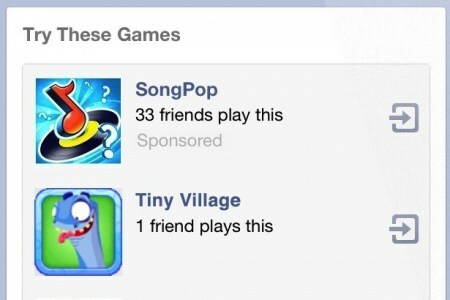 Banner ads won’t fade overnight but they are losing favor with advertisers. Opera Software said that static and expandable banners went from 66 percent of ads in January of this year to 36 percent in June. Those are the major mobile ad types that are growing. Below, are some other formats where the spending is smaller but that publishers and developers have high hopes for. 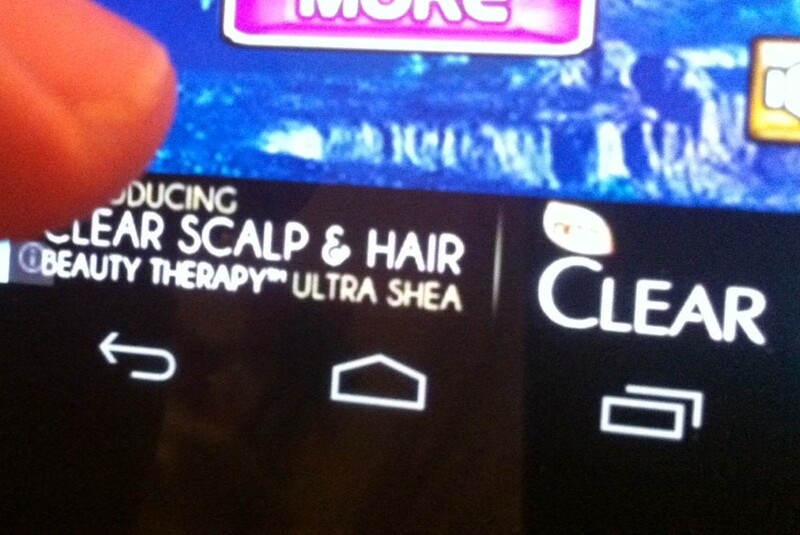 One of the most promising parts of mobile advertising because it leverages the mobility of smartphones and tablets. But the early efforts have been slower to take off, in part because ads delivered via geo-fencing or proximity don’t necessarily catch people at a time when they want to act or don’t factor in a person’s preferences. Providers like Sense, JiWire and WHERE are getting smarter about mixing location data with behavioral profiles to deliver more relevant ads to people. Companies like Waze, a crowd-sourced navigation app, and Roximity, which hooks into in-car entertainment systems, are showing how drivers can also be targeted with location-based ads in their car. There is a danger in being too pushy with location-based ads, and creeping out users who don’t know their location is being tracked. BIA/Kelsey forecast that U.S. mobile local ads, based on a user’s location, will grow from $664 million in 2011 to $5.8 billion in 2016. The latest rage for companies like Facebook, Twitter and Tumblr. Unlike with standard ad units, publishers help advertisers create messages and content that work within the flow of their platforms. By using the existing units of content, like a tweet or update, advertisers have an organic way to advertise through mobile that is harder to ignore. Facebook said it now gets 14 percent of all of its revenue via mobile sponsored stories and install ads, which appear right in the news steam of its mobile apps and website. EMarketer estimated that Twitter would make $129.7 million in mobile advertising this year, more than Facebook. The challenge with native advertising is that it can be hard to replicate across different publications and often requires more work to cater to each platform. There are some other approaches that show that it’s not just about placing a basic ad somewhere in an app or website. Kiip (see disclosure below) rewards people after achievements and milestones during games and apps. Pontiflex lets people sign up to receive ads and offers from brands they select. 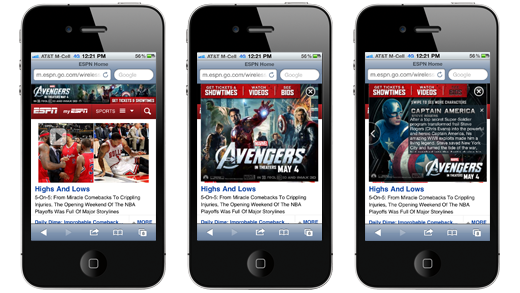 Appssavvy allows advertisers to place ads alongside activities inside apps and websites. Tapjoy helps people earn in-app rewards for watching videos, installing apps or subscribing to services. Conduit is creating lock-screens for Android devices that can be branded and potentially carry advertising. Look at all you idiots commenting and peddling your products. Is the real value of mobile really going to come from advertising? I would argue that mobile advertising has not really been 100% successful to date. Sure, the increased relevance that might come from location, social network integration and actionable offers might lead to more consumer value, but mobile advertising, whatever the format, will still be push marketing. 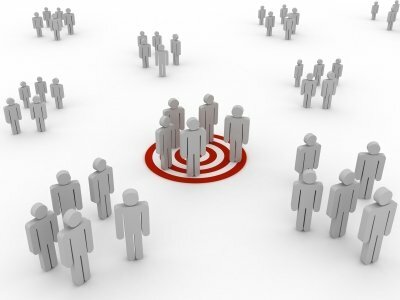 Push marketing on such a small screen, with so much else vying for your attention is not, in my opinion, ever going to create long term relationships or value. It is invasive and somewhat backward looking – mobile has so much more to offer that a re-engineering of web display ads. Jonathon Edwards looks to joining mobile with traditional media as a source of consumer value, and tying up these two channels makes perfect sense, but why stop there? Mobile is unique in that it is present across many channels, and stays with the user as they move from screen to screen, media to media and channel to channel. In this increasingly multi-channel, social and reputation driven world, mobile has the potential to be the unifying element that turns a brand engagement into a brand relationship. Mobile is not just about any one thing, it has the power to be a part (big or small) of almost every consumer journey – allowing dynamic and intelligent comms and dialogue that blends the online and offline worlds. What I am suggesting is a paradigm shift in marketing and comms. Starting to think less about mobile (or other channels) in isolation, and starting to talk about ‘experience’, is where the real consumer and business value lies. There are very big barriers to this happening. Specialist agencies and silo mentalities in corporations both conspire to mask the real consumer demand and value opportunity – Brands and businesses that are always accessible, consistent, meaningful and valuable across any channel. Thanks for this great article on the importance of mobile advertising. As you mentioned, cookies donâ€™t work and other solutions such as UDID and IFA only work in-app or raise serious privacy concerns. In order to move advertising forward with the mobile-obsessed world, marketers need to find a universal device recognition solution that will keep the interests of consumers and marketers in mind. The true value in mobile and the future growth of this media will be when it is used not as some ‘stand alone’ push ad solution but rather as a way to create engagement between brand & consumer from traditional media. See, hear, read be recommended a brand message, go mobile and land to a real time optimized solution. The real time collection of opt in data from the consumer and invaluable media analytics will lead this ‘personal’ connected device to serve true purpose. JUST don’t use it to spam consumers or else your mobile experience will be short lived. Jonathan – great points. For the large brand who can afford to make highly creative, engaging advertising the engagement route is clearly the solution. For smaller operators, they are best suited to focusing on search IMO. The Internet is like a giant yellow pages directory and the best leveler of the playing field is search and niche content marketing, IMO. And yes, don’t spam or we’ll have do not track and other tools used against the marketing industry and then our hands will be tied and we’ll have blown our chance to get real consumer engagement and deep data insights. Great summary Ryan. I think it is the location-based marketing and the category labeled “other” that will really show the power of the mobile platform to drive sales, foot fall and brand engagement. Banner ads, interactive banner ads, sponsored posts and search advertising are often times far too random to generate consistent and effective results. Mobile is about targeted, focused outcomes with real results. Plus, can we really be happy with a 2% “effective” rate on mobile? In India, mobile advertising is mostly used by downloading products and free classified companies, which i experience. Lump it into the rest of digital, as long as it is properly planned for it can be great. It’s up to be ready first. You can’t make a great mobile ad with out a great place to put it.